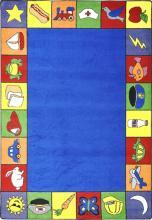 Preschool Carpets will give your students a Head Start! You have probably heard some people say, "I can't believe what these young kids know." Well, we make it possible for your students to know more than most kids their age by designing Preschool Carpets. Our carpets contain twenty-four different images that form a very colorful border. You students will learn about food, animal, and weather topics. These carpets have been designed for Head Start programs in preschool classrooms around the country. We construct the Preschool Carpets with SoftFlex®, which is an air-texturized, polypropylene secondary support back that ensures your students learn in comfort. The tightly woven fibers withstands the antics of your most rambunctious children, while insulating them from extremely hot or cold floors. We treat each carpet with compounds that make is easy to remove dirt prints and juice box spills. All you have to do is wipe with a damp cloth and the stains disappear. Choose from three sizes to meet your classroom needs.